Moriah Jefferson defends the perimeter. Photo by Steven Slade, University of Connecticut Athletics. The video that plays prior to player introductions at Connecticut home games is called “Relent11less Pursuit of Perfection,’ with the numbers signifying the 11th National Championship the Huskies are pursuing. With the way the 21-0 Huskies have dominated this season, the title might turn into reality. Connecticut’s dominance has not been seriously challenged since late December, as they have stomped the competition in the American Athletic Conference for the last six weeks. But Monday night in Columbia, South Carolina, coach Dawn Staley and her No. 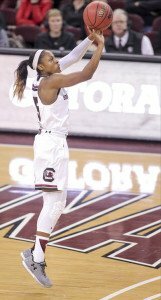 2 South Carolina Gamecocks have a chance to change that narrative. The Huskies will enter a hostile, sold out Colonial Life Arena to face a team that went to the Final Four last year. Possibly in anticipation of a battle in the paint, Auriemma had his team work the ball inside for most of the first quarter against a scrappy but outclassed East Carolina team on Saturday. Morgan Tuck played just 17 minutes, and moved well, but her down-time (she missed three games caring for her surgically reconstructed knee) showed as she missed several shots she usually makes. Her time on the court Monday will be crucial to UConn’s game. UConn did not need many minutes, as they stomped yet another AAC team, 92-46. The post-game interview paid little attention to East Carolina, but quickly centered on Monday’s nationally televised contest (ESPN2, 7 p.m. Eastern). 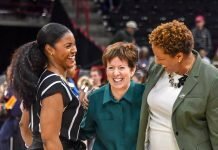 Auriemma was effusive in his praise of the Gamecocks and their ascendance to the top of women’s basketball. 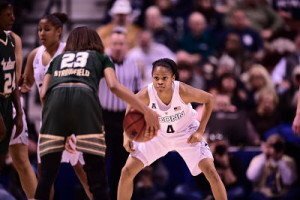 His focus, however, was on All-American senior Tiffany Mitchell. Asked if this game could be South Carolina’s equivalent of the January 1995 game at Storrs between UConn and Tennessee that launched Auriemma and the Huskies onto the nation stage, Auriemma was not sure. Tiffany Mitchell elevates for the basket. Photo courtesy of South Carolina Athletics. If unlike Auriemma, Husky fans were looking towards Monday’s game, they have to be pleased. Kia Nurse, who has been in something of a scoring slump, led Saturday with 20 points. 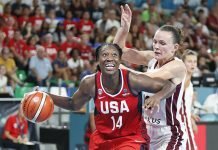 Freshmen Katie Lou Samuelson and Napheesa Collier looked like they understood the larger picture of what was going on, and sophomore Gabby Williams brought the excitement and athleticism that she showed early in the season. These reserves are sure to come into play if foul trouble strikes the Connecticut starters. The freshmen seem to be close to completing the transition from newbies to players. So, here comes the latest “game of the century.” In the end, either a new or an old number one will be in the rankings on Tuesday. Auriemma doesn’t want fans to be disappointed. Connecticut teams have usually risen to the level of the competition. Perhaps looking forward to the biggest challenge they have faced in 2016, they raised the level of their play against East Carolina. If this game truly is a preview of the Huskies’ play at South Carolina, they will return to Storrs Monday night still undefeated and still No. 1. This Husky great team is not yet perfect, except for their record over the last 58 games, the third longest in history. All three records belong to Connecticut. No team, all of last season, came closer than 11 points to the Huskies, and two teams have done that already this year. Both of those teams could be Final Four opponents. The Connecticut defense is not (yet) what it was. They have given up dozens of open threes: 13 to DePaul (currently RV/24), 13 to Notre Dame (#3), and 9 to Colgate, for heaven’s sake. And those are made threes. Communication on defense when there is nearly always one freshman on the floor is not what it was with seniors Kaleena Mosqueda-Lewis and Kiah Stokes last year. The current group, freshman Gabby Williams and Napheesa Collier may be more athletic than KML, but they do not have the experience with their teammates that is needed for the best defensive communication. This team has no one coming off the bench who has the defensive stopping power of Stokes. The teams the Huskies are likely to meet in the Final Four can all score. Keeping up with Connecticut’s scoring machine is difficult for lesser teams, but not for Notre Dame, Baylor, South Carolina and even Maryland defense separated the Huskies from everyone last season. Not so much this year, particularly if they continue to give up all those threes. Connecticut is not shooting the three nearly as well as last season. Jefferson, who shot over 50% last year, is down to 40%, though it is creeping upwards recently. Kia Nurse is shooting just .310 from beyond the arc, and more important, only .408 overall. Morgan Tuck’s health: Tuck is the glue that never lets her team get too crazy on the floor. She is the calm leader. But she has a bad knee, and has missed several games this year to rest it, including three of the last five. If her play is limited in April, the glue might let go in the pressure of the Final Four. The teams they will face there are all good enough to spoil the dream. This is not to say that UConn is anything but the favorite. It only means there is some work to do. Until someone beats Connecticut, however, their strengths make them the odds-on favorite for the national championship. Can South Carolina pull the upset? Of course they can. They will have the strength of 18,000 fans behind them, and they are undefeated at home for the last 45 games – the current women’s home record. That record survived a scare just this week, however, as No. 18 Kentucky was down by only two points with 2:39 remaining in the game. The Gamecocks dug deep to win by ten, showing a maturity as a team that was not as evident when they lost to Connecticut by 22 almost exactly a year ago. The bottom line for everyone not Connecticut is that the Huskies are potentially vulnerable, but still superior. 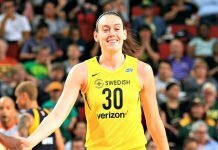 Their leaders – Moriah Jefferson, Breanna Stewart and Tuck – save their best play for the best competition. No team has shut down two of them at the same time all year. The supporting cast is better than when they played Notre Dame. They seem to thrive on adverse road crowds. They defend with excellence and they score the ball like no one else.